Unlike other artists at his school he was this first one to do abstracr expressionism. 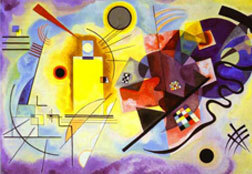 Kandinsky was a sensitive and passionate man, I think that’s why his paintings are so expressive. When he was 50-years-old Kandinsky met and married Nina Andreevskaya, a 17-year-old art student. He’s had three wives in his lifetime. He also published another book on Spirituality, this time in relation to art, and he wrote several plays and poems. He had already formed the New Artists Association in Munich. In his writings Kandinsky emphasizes this superiority in advancing toward what he calls the epoch of the great spiritual. Painting was, above all, deeply spiritual for Kandinsky. 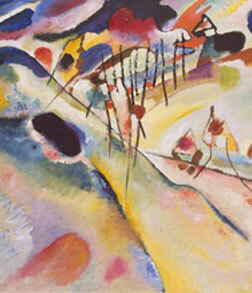 Kandinsky set the stage for much of the expressive modern art produced in the twentieth century. In recent years, his artwork has sold for well over $20 million. 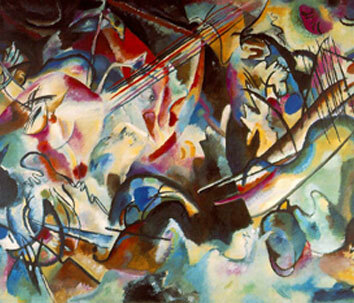 Vasily Kandinsky is an abstract expressionism artist that was born in Moscow, Russia. He learned how to play the piano and cello all by himself. He studied economics & law, as soon as her graduated he became a teacher. In 1895 Kandinsky attended a French Impressionist exhibition where he saw paintings by Monet and he became quite interested in art. When he started getting into his 30’s he went to art school. He learned how to sketch, paint, draw, etc. Kandinsky's work moved in a direction that was of much greater abstraction than that which was pioneered by the Impressionists. He shows his emotions through the strokes of the brushes.